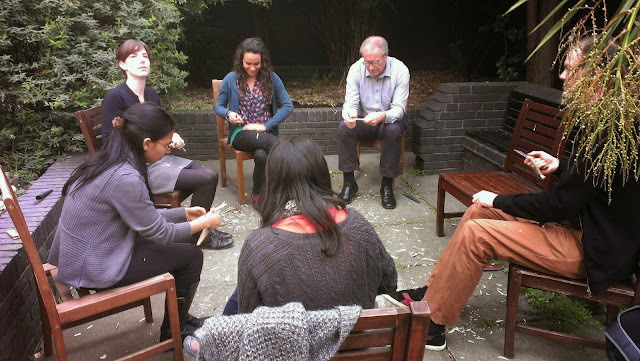 When I'm not carving things or out in the woods, I'm usually found in an office in London working on Eco-Schools for the charity Keep Britain Tidy. Each year in September Keep Britain Tidy has a Waste Less Live More week. Last year the theme for the week was food and food waste. 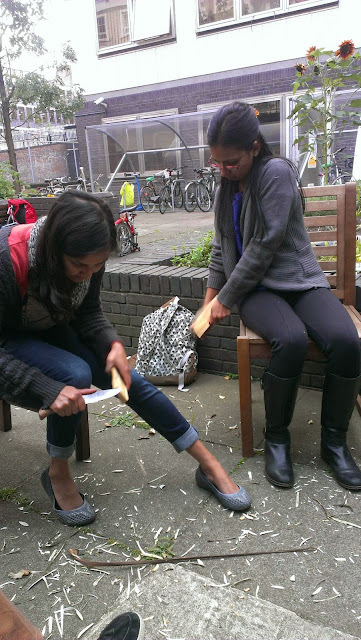 This year the week is running from 22 - 28 September and the theme is 'Be Resourceful'. 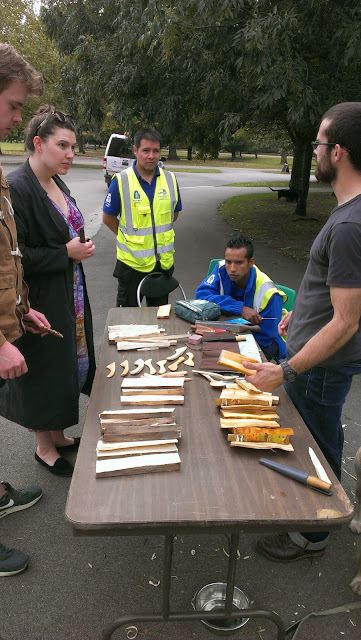 To encourage people to be resourceful and to raise awareness that what's good for the environment is good for us, I decided to teach people how to carve wooden butter spreaders, a nice introduction to green woodworking. In preparation for the workshops I thought I'd give myself a bit of a refresher, as it's been a while since I've done spreaders. I had a nice round of cherry left over from the bits of wood I hauled away from Spoonfest. Using an axe and a wooden club I split the round in half, and half again, until I had eight pieces of wood to work with. I sketched out a rough design on them. 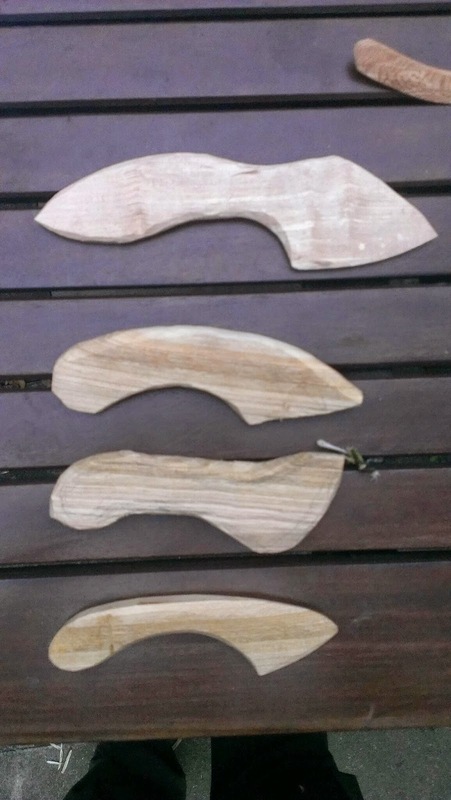 I made each one was slightly different to experiment with the design a little. I went back and forth between using the axe to rough them out and solely using a knife. Some of the pieces of wood benefited from being split again, especially if I was just using the knife. I ended up with 11 spreaders. It didn't take too long to make these. 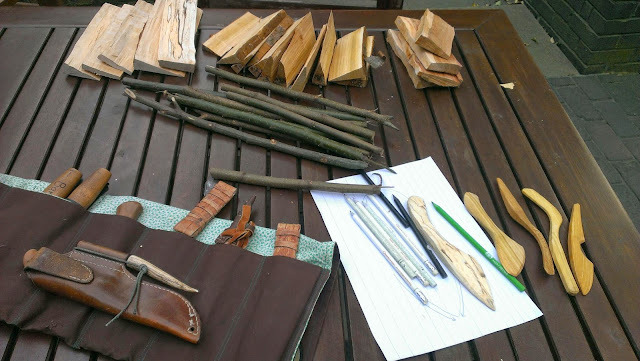 It was good to do them as it highlighted which knife grips would be the most beneficial to use, the areas where learners might have trouble and how thick to split the blanks. While this isn't wood carving, charcoal is a cool sustainable product and making it used to be a really process widespread across the UK. 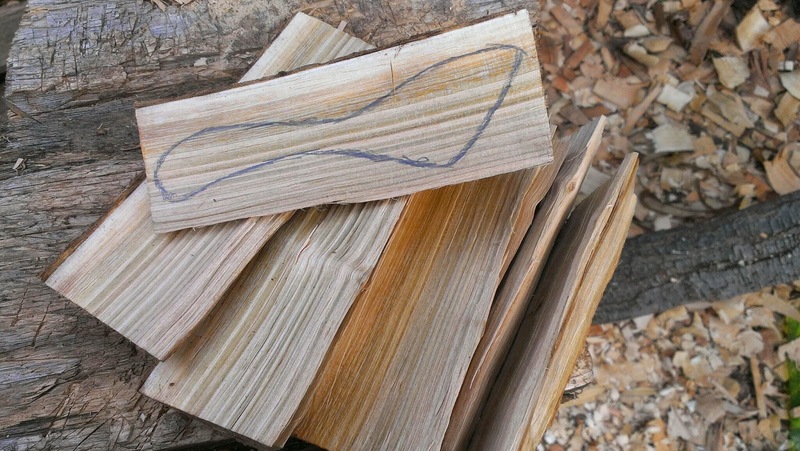 It's a great way to use smaller diameter wood that it can be hard to find uses for. I often help out at Pound Wood, an ancient woodland that's managed by the Essex Wildlife Trust as a coppice site. A common product from coppice woodlands is charcoal. Charcoal is wood with the water removed by setting fire to it and then severely limiting the oxygen it receives. The charcoal from Pound Wood is sold locally. 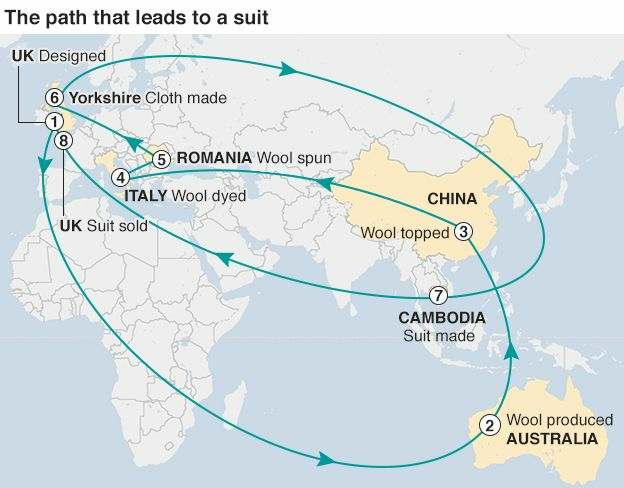 A fantastic British product made very sustainably. 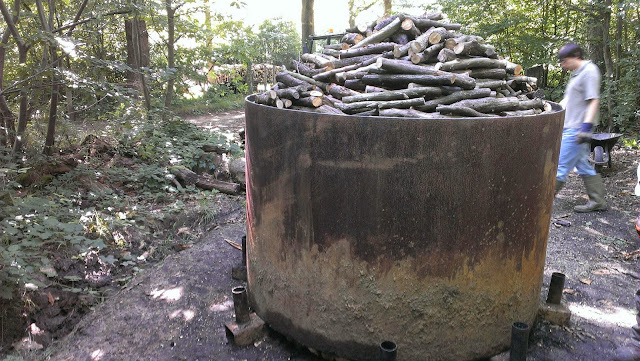 Here's the wood pile that needs to be loaded into the kiln. There are two stacks, one in front of another, about a meter tall and three meters wide. This was all cut to length the week before. 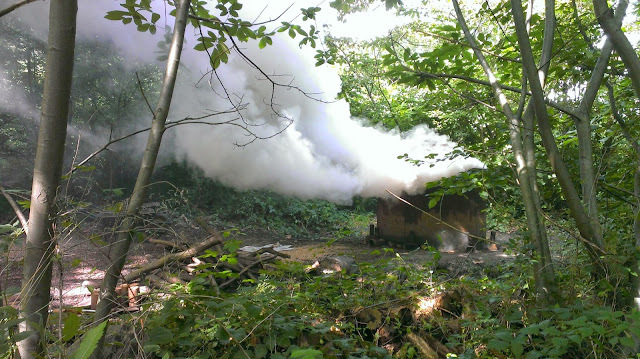 Here's the kiln, in the middle of the woodland. 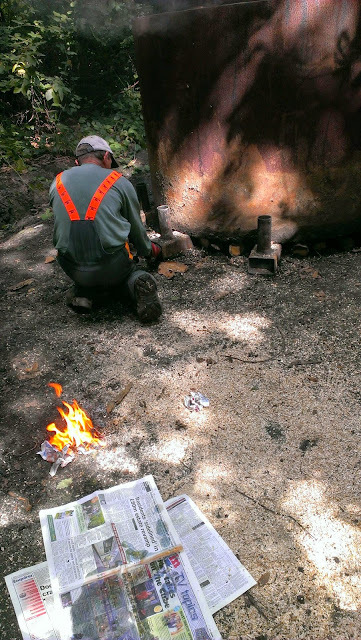 The white dumpy bag was in the kiln and contained the 'brown ends' from the last charcoal burn. 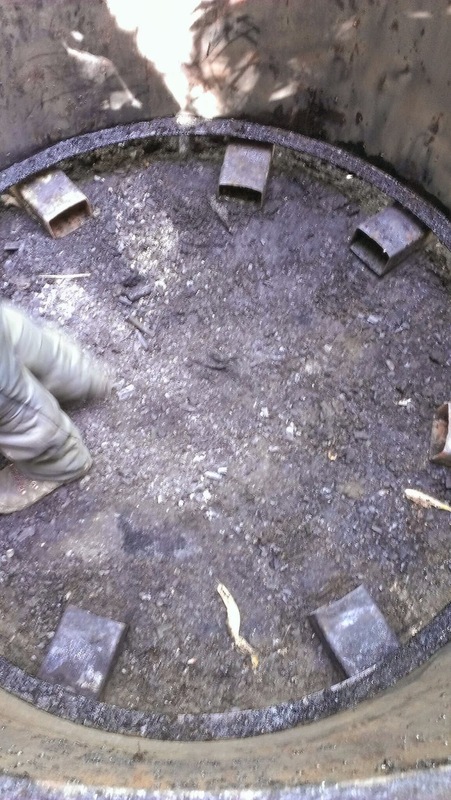 The 'brown ends' are pieces of wood that didn't fully convert into charcoal. They'll be used as fuel in this burn. In front of the kiln are two of the vents we had to place under the kiln at regular intervals. There are eight vents. 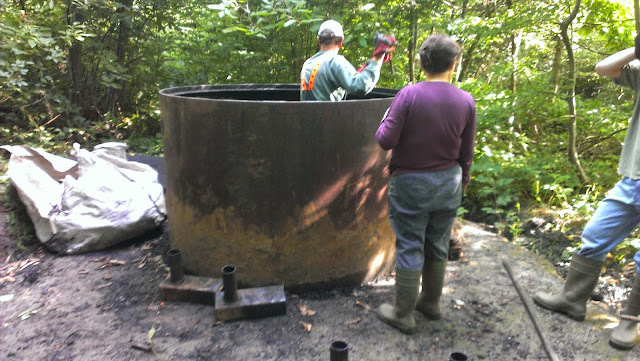 During the burn four will let air in and four will have a chimney attached for smoke to escape. 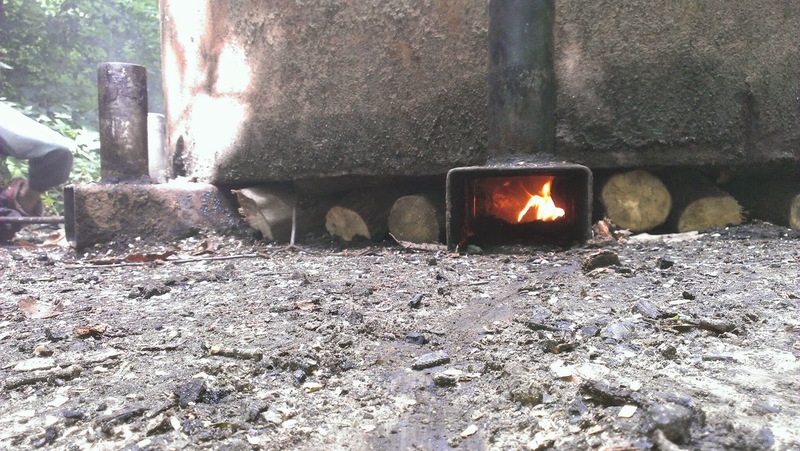 The first layers of wood need to be laid in a way that leaves a channel from the vents to the centre of the kiln. 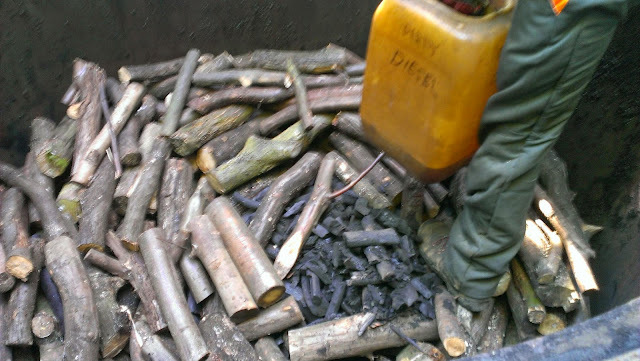 Here wood has been stacked around the outside, with diesel soaked 'brown ends' in the middle. The wood is stacked as closely as possible together to limit the flow of oxygen. 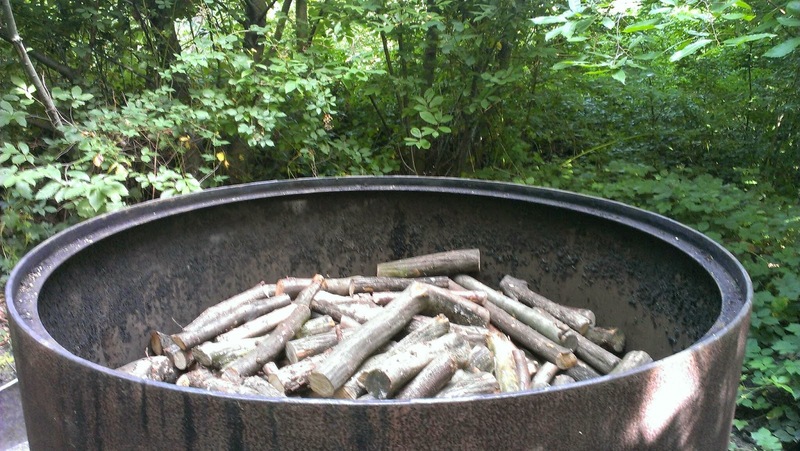 If too big a gap is left, the wood around that gap is likely to burn and get consumed, instead of converting to charcoal. We continued to fill the kiln and around the point the wood reached the lip of the kiln, the pile of cut wood we had ran out. Had more small diameter available and cut that to length and finished stacking the kiln. The kiln is filled to leave as few gaps as possible. It's actually slightly overfilled, but the volume reduces as it is converted into charcoal. Here's the kiln ready of lighting. Using diesel soaked fabric inserted into the vents, the brown ends are lit. It doesn't take long for the fire to really get going. 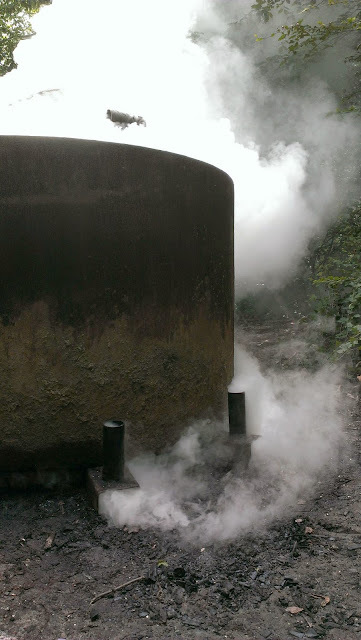 Most of the smoke is actually water vapour. We let it burn for about 45 minutes, until the lid fit snugly against the rim. We put caps on four of the little chimneys, making them air-intakes. The other four had the vent blocked and a chimney tube attached. 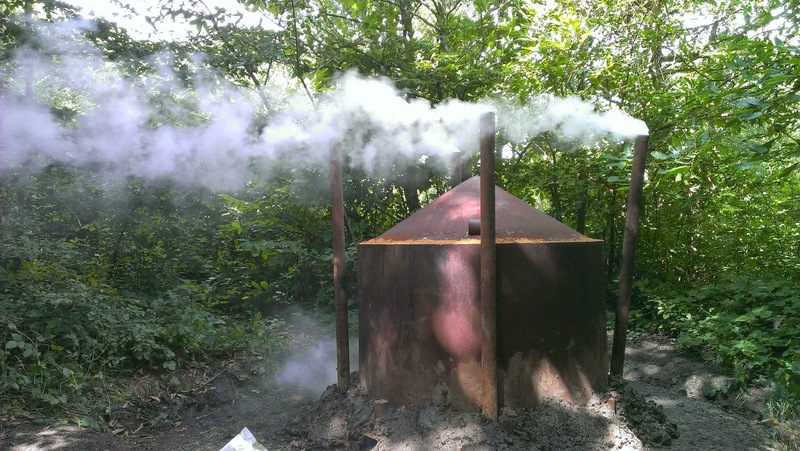 After eight hours the chimneys and vents will be swapped around to 'reverse' the direction of the burn, which will hopefully ensure as much wood is converted into charcoal as possible. 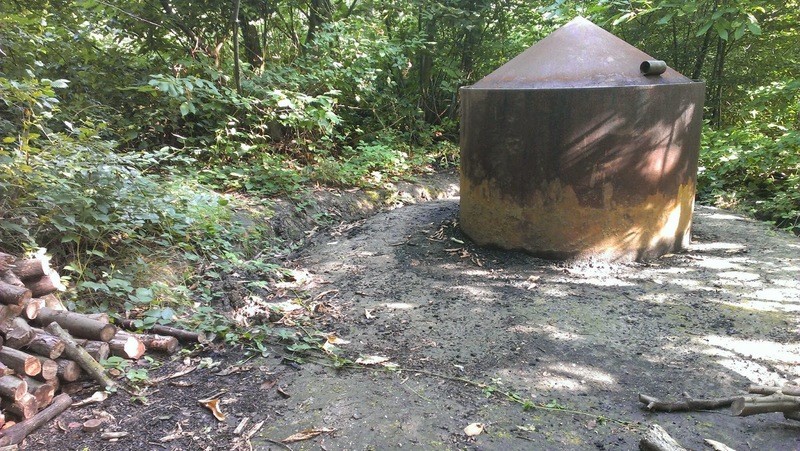 The entire base is sealed using a liberal amount of clay dug from the ditch around the kiln. The lid used to be sealed with clay as well, but it turns out that sand creates a better seal. The kiln will be left for eight hours, when the chimneys and vents will be swapped around. The kiln will burn for a further 8-10 hours and then will be shut off. It will be left for a week before being unloaded. Eventually, possibly at the threat of being rammed by a camper van, the gates were opened and we streamed into the verdant field of spoons. I spent a few moment trying to figure out the best spot for my tent, engaging in some rather complex calculations (distance from toilets, ease of access to car, line of sight with marquee, likelihood of being next to a snorer, prevalent wind direction, angle of the sun, nearest ley line, etc). Finally I settled next to where two identical tents had been pitched next to one another, if only for the potential comedy it might provide. I tucked my tent as close as I could to those around me, so as to not repeat the horrors my tent’s guy-lines inflicted on people last year. Really, the less said about that the better. Once unpacked and settled, I wandered around, bumping into a few of the instructors, the lovable Barn, the holy Hazell and the distinctively coiffured Owen Thomas. 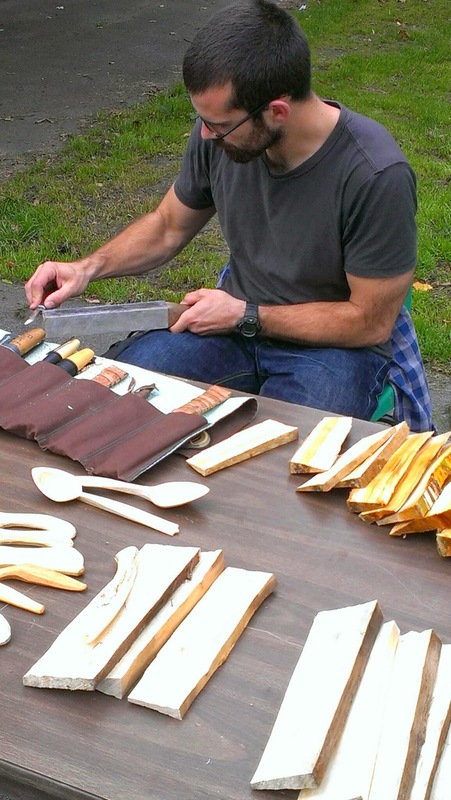 Ensuingly, proceedings in the marquee began, with the instructors all being given their chance to tout their wares for the following days of spoon tutelage. 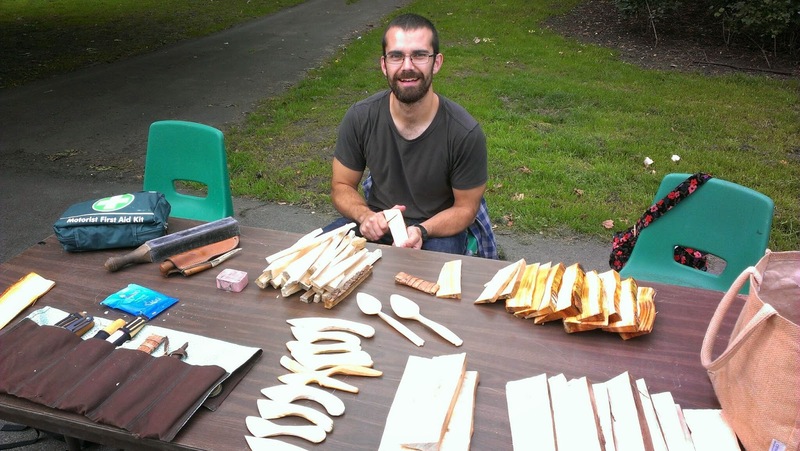 A moment of silence was attempted for all the trees that aren’t yet spoons, but Barn’s insistence that he was ‘being serious’ only encouraged people’s chuckling and tittering. Robin eventually split the sacrificial billet and the bar opened Spoonfest officially began. 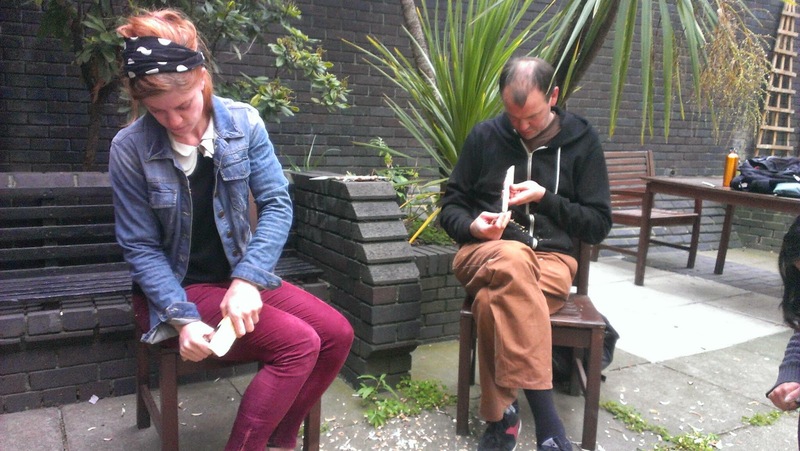 On Friday, the workshops were focused on the neophyte spooners. While it is always good to be reminded of the basics, as one man’s basics are rarely the same as the next’s, I however thought it prudent to save my pennies for the spoon shop. Therefore I strode out to the woodpile to inspect this year’s timber tributes. Amongst the regulars of birch and cherry I found some almond. The steel of my axe has never tasted almond, so I helped myself to a small round. 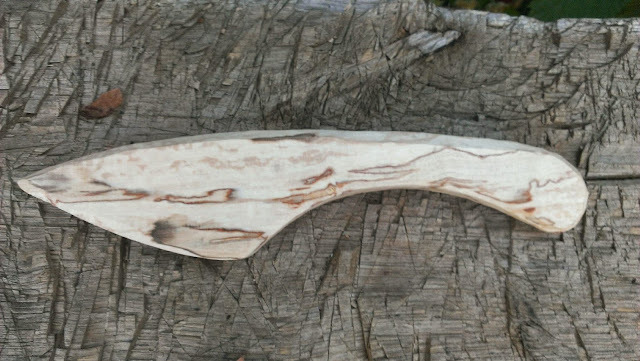 I carved two spoons from it, handing out the rest of the wood to other carvers similarly interesting in testing out a new material. One of my spoons harked back to the Welsh dolphin spoons and the other more reminiscent of the Swedes. The Welsh spoon was carved radially and the Swedish style spoon was carved tangentially, so as to properly explore what almond’s grain had to offer. I then helped myself to a crook of wild cherry. The wood split nicely, but the lip of the bowl kept checking (developing small cracks). The intermittent cloud/sun probably wasn’t helping matters. I carved on regardless. Eventually one of the checks deepened and I had to admit that a crack had formed. It wasn’t great, but I asked the opinion of those around me. Some said chuck it, various glues were suggested, others said to ignore it and use it regardless. Sean Hellman offered some nice insights: glue wouldn’t work for this ladle, as they don’t stand up well to hot liquids. 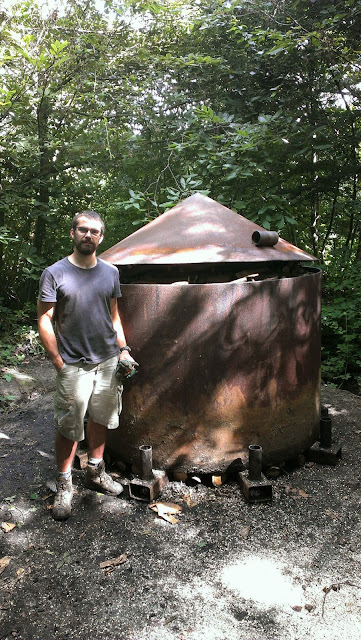 Sean makes a lot of large shrink pots and cracks in those can negate a whole day’s work, so he’s investigating decorative methods of repair, such as copper wire or butterfly joints. He said these might be tricky to apply to a spoon, but I’ll keep my eye on his blog for any such methods he may be sharing. I’ll then be amazed at the skill with which he’s done the repairs and resign myself to using superglue as decoratively as I can (which isn’t saying much). This year I decided to put some spoons in the spoon shop. I brought spoons along last year for that intention, but chicken out and put them all in the spoon gallery instead. I laid out my dozen or so spoons, all carefully labelled and priced. I was strangely proud to see my spoons lying next to all the others on offer and not looking entirely out of place. I also had some spoons I wasn’t quite ready to part with and put those up in the gallery. On Saturday I was up earlier than I intended, my body unaware that I didn’t have to wake up at 5am, but doing so regardless. The Spoonfest field that early in the morning in a magical place, the silence broken only by snoring, trains, farming equipment, the curses of sleepy eyed people tripping over guy ropes and the clang of portaloo doors. I stumbled about, performing my morning ablutions, eventually finding the coordination to light my cooker and make some coffee. Properly caffeinated I wandered over to the fire to join those other morning larks in smoky conversation around a bubbling kettle. I soon decided to join the rapidly lengthening queue for the day’s workshops. Closer to the front than the back I was fairly confident I would be able to get on Martin Hazell’s burr scoop workshop, one I had been meaning to attend since last Spoonfest. Martin’s workshop was an interesting one. 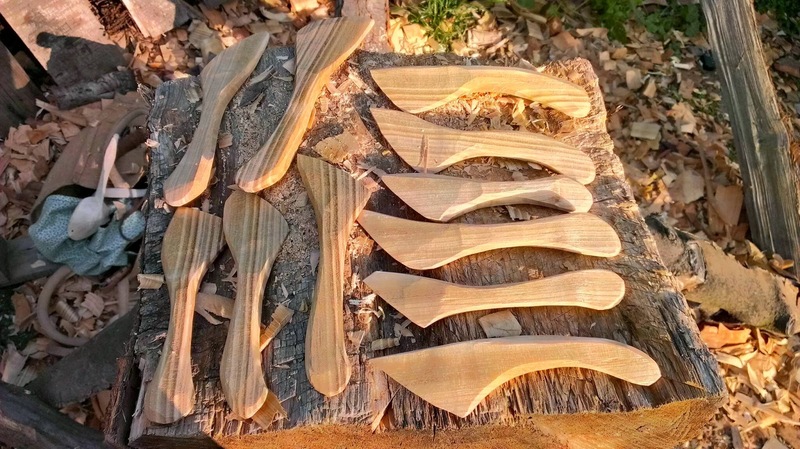 Having carved spoons for a few years now, I know how to carve a spoon, but having never worked with burr wood, I was hesitant about diving into it on my own. Martin clearly and humorously explained to us how to remove a burr, the difference in grain between burr and normal wood, and how to use some of the mini-gouges. I stuck with the tools I already have, not wanting to get enamoured by another shiny bit of metal. I was impressed with how well the twca cam faired at carving a small bowl (initially at least). My HK spoon knife was sufficient to finish off the scoop I made. For me the biggest difference in using burr wood is in the roughing out. 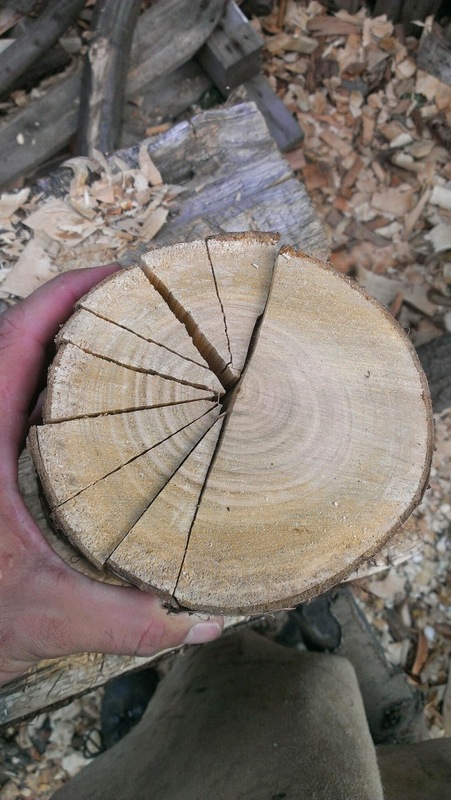 When removing larger pieces with an axe or knife, you expect the pieces to split away in a certain manner. This is not the case with burr wood, as the split follow the grain, and the grain goes every which-way. This means small cuts with the axe and (for me) moving onto the knife a little sooner than I normally would. All too soon the 90 minutes allocated for our workshop had elapsed, but we hung on a little longer, with Martin providing hints, tips, encouragement and regular insults (so we didn’t get too pleased with our progress). Immediately after we left the workshop I hunted through the woodpile for some more elm burr. 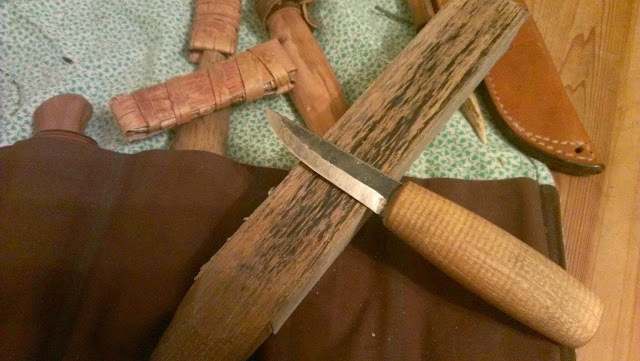 Finding some, I wanted to carve a deeper burr scoop, something akin to Jon Mac’s kuksas. 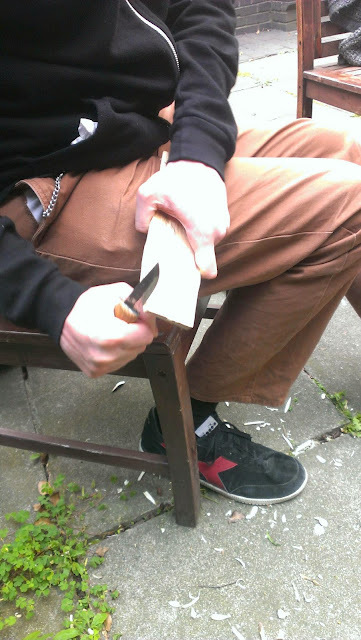 I spent most of the day working on that scoop, sitting around one of the carving blocks with some rowdy Scots. The carving block soon became the ‘story telling block’. Anyone was welcome to use it, but had to tell a story about themselves whilst doing so. We had stories of bodies down wells, tarantulas up trouser legs and lifesaving rain jackets. Saturday night’s campfire entertainment was stellar, as usual. In fact, there were two campfires, for a while seemingly competing with one another. Under the tarps there were traditional folk songs, flutes and fiddles. Under the stars there were guitars, drums and, a hilariously gravelly voiced rendition of Britney Spears’ ‘Hit me baby’. Eventually, as numbers began to thin, revellers coalesced around the fire under the tarp. There the singing continued, as did Steve Tomlin’s pleas to be driven to a rave in Manchester. However a couple of traditional Swedish songs about frogs seemed to placate him. On Sunday I wasn’t sure which workshop to attend. It was a dead heat for Anja’s spoon decoration and Sean’s sharpening. While I really love Anja’s bold style and everyone who took her course the day before only had good things to say about it, I felt that knowing how to properly sharpen my tools would serve me better in the long run. Sean’s course was definitely informative. I‘ll be purchasing myself a jewellers loupe in the near future, so I can properly inspect the ragged state of my tools’ edges. Unfortunately, none of my tools were in that sorry a state as I had bought one of Sean’s sharpening systems about a year ago, which has kept my tool edges in a good condition. While there wasn’t much metal removal for me to be getting on with, Sean’s advice for me was to watch the secondary micro-bevel that’s starting to develop on some of my knives (Sean does recommends a micro convex bevel to add strength to the edge). If the secondary bevel stops being micro, then slicing long, thin wood chips becomes difficult. All I need to do to get it back into tip-top shape is to work through some coarser grits. After the workshop I spent some time struggling with a couple of blackthorn crooks. One had an unfortunate knot that revealed itself where I wanted the spoon bowl to be. Not great. The second suffered a similar fate to the cherry ladle, checking along the front of the bowl. Slightly dejected I decided to pack up my tent and collect my spoons from the gallery and spoon shop. 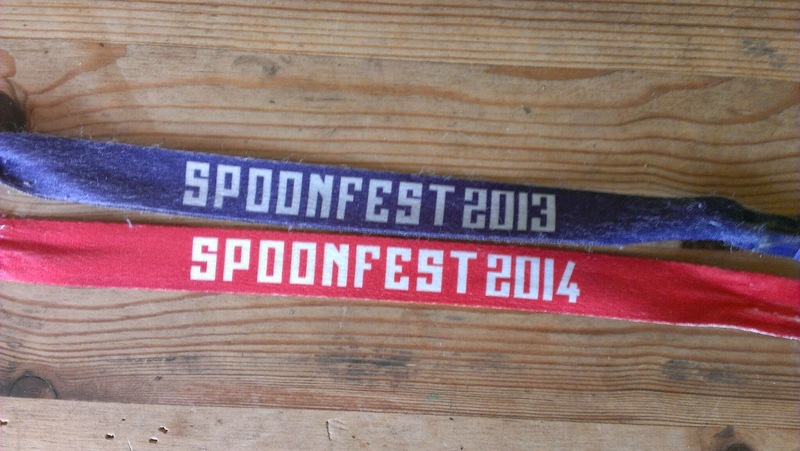 I managed to sell one of my spoons, which made me happy. 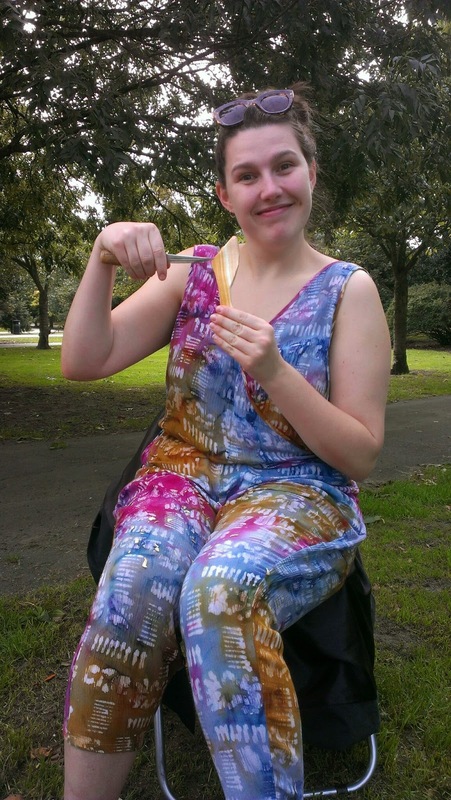 With all my spoons in hand I did a couple of spoon swaps, and generally chitchatted my way around the site. With about an hour or so to go before Spoonclub, I wasn’t sure if I was up for it, having slept very little over the weekend and my office-soft hands were starting to show a bit of wear and tear. I did help myself to a nice lump of cherry, thanks to a guy called Richard who just liked to saw wood. 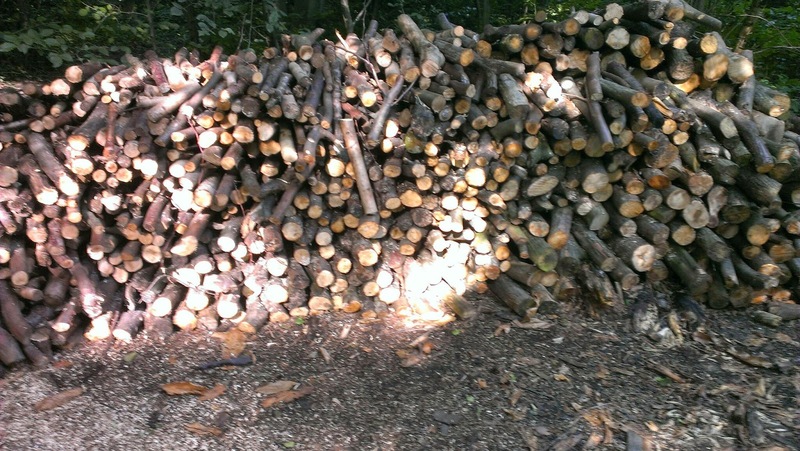 I also walked off with rather large chunk of beech I was encouraged to take home, lest it become firewood. After three days of spooning, I hopped in my car and made the journey home, stinking of wood smoke, fingers calloused and sore, as happy as hell.